Doesn’t she really take your breath away. Didn’t I tell ya she was gorgeous! Starship Enterprise does put the rest in the shade but they still have a beauty all their own. This one below is similar though not quite as flashy. It rained here yesterday, the water droplets add a bit of panache to the photos. Superstition, in real life it looks more black, but these photos show his purple side. Prince George…or was is Edward…hmmm, it is Prince something or other. See that behind him, to the left??? That is one of my trumpet lilies. You think this garden smells luscious now, just you wait until those babies bloom. Then the entire neighborhood will be perfumed! I tried to get a good photo of the entire side yard. You would see this view driving up beside my house. I live on a corner lot. I get a lot of drive by gawkers. I don’t’ blame them, I drive by real slow myself when I come up this hill. 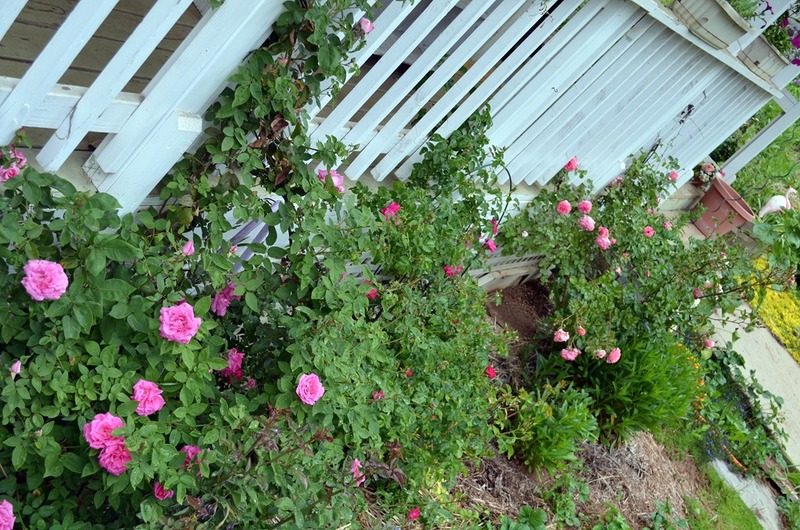 I also attempted to get a good shot of my roses, I stood at the top of my back deck stairs and shot downward. So if the angle seems awkward that is why. Things are changing daily in the garden. 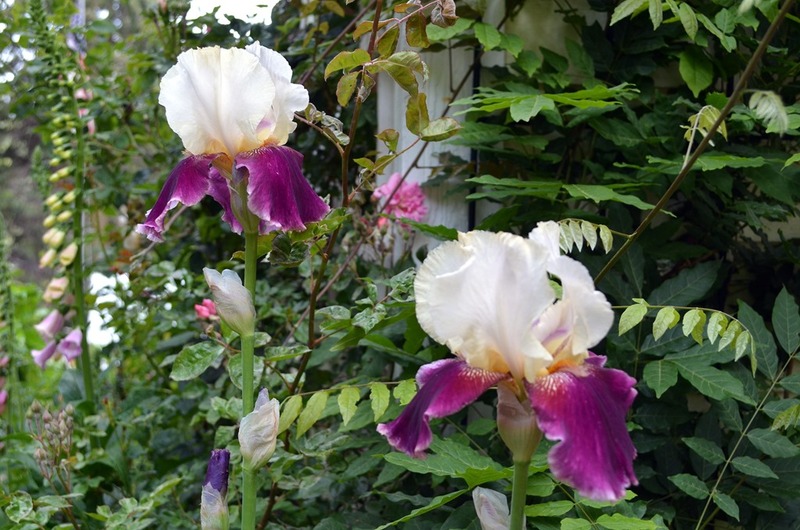 As the iris fade soon they will be replaced by warmer weather loving flowers. The mostly purple border will be awash with summer yellows, oranges and reds. I tried to toss in some blue with Delphiniums and Larkspur but we shall see how well they do this year. 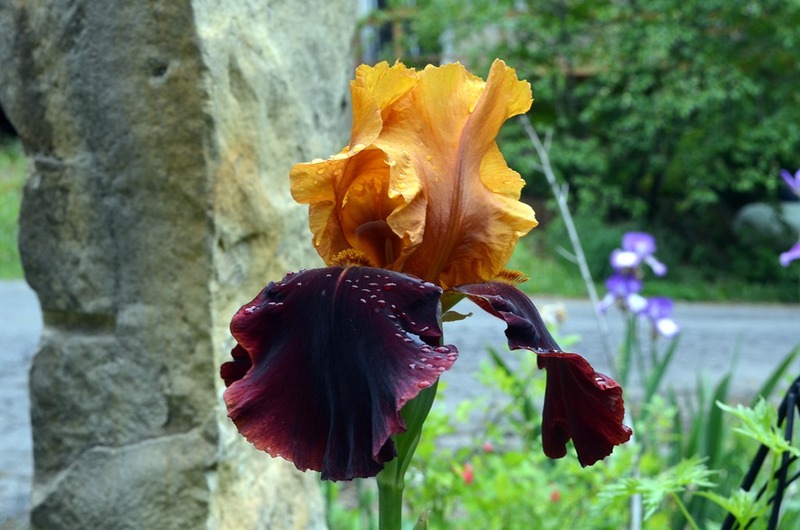 I get most of my Iris’ from Schreiners Gardens. I am not an affiliate of theirs, wish I was. That is just where I have find the most awesome Iris. Stunning!…………………..Now that would look fabulous in my garden I will have to see if I can find it over here. I am about to re-do the flower beds….. Time to go shopping I think !! Wish I could send you one, they are so lovely to see in the garden. That was a really breathtaking visit! So beautiful! Congrats on a lovely show, and the post is just one stream of your love of flowers. I’m so happy to have stopped by. I hope to see you again. Yes, I do have lots of flowers to share, they are my joy. I love the paint them as well. Not that I am great at it but I do give it a whirl. I am so glad you stopped in. beautiful flowers. I love the gardens in the more northern states. I love gardens everywhere, though I would have to relearn so much if I lived more southern. Oh yes, I am more than ready for even warmer weather. I love, love summer! 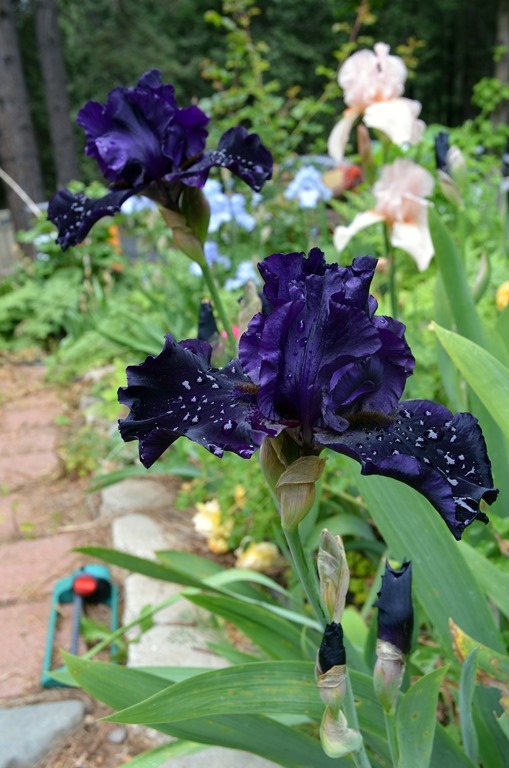 Pamela, your irises are just gorgeous! God is so creative, isn’t He? Enjoyed all your photos. Yes, He is unmatched in artistic ability. Magnificent variety of Iris!!!! The Starship Enterprise is gorgeous and I would love to have that one. Having the house on the corner is really nice. Happy Pink Sat. 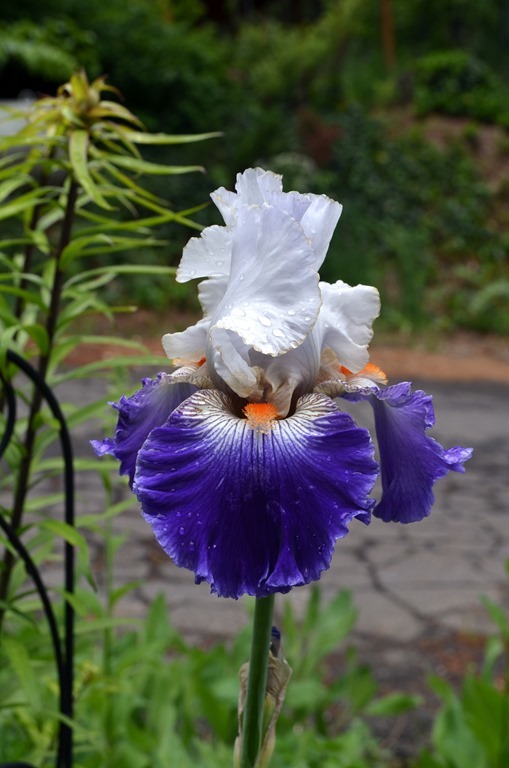 Your iris garden is beautiful. use to call them “flags”. 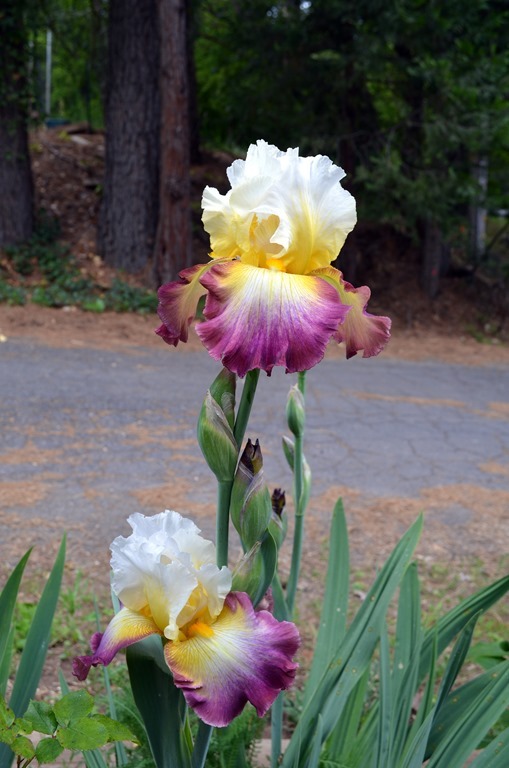 Your iris blooms are positively regal! 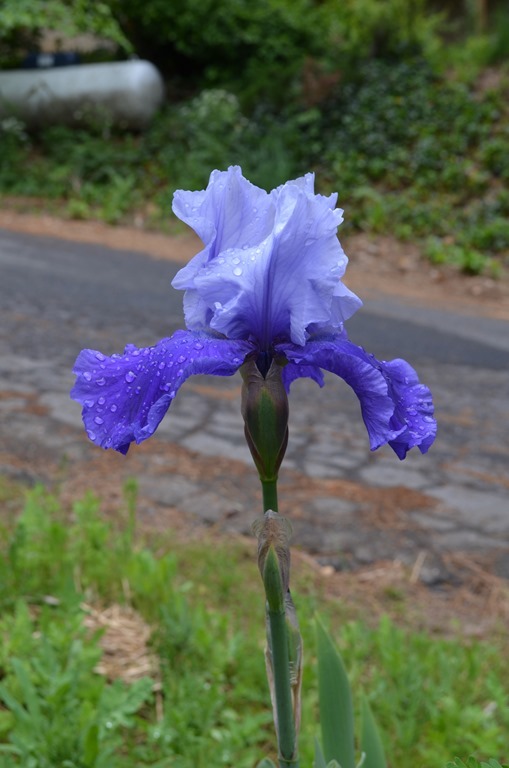 They are blooming here right now as well … not that I have any. But certainly admired a home nearby with a lovely display. Thank for the link to the nursery. Will check them out and hopefully place an order — would love some of these beauties in my garden. They do have good sales at Schreiners too where you can buy a nice collection for a very reasonable price. They are so easy to grow, which makes them even more enjoyable. 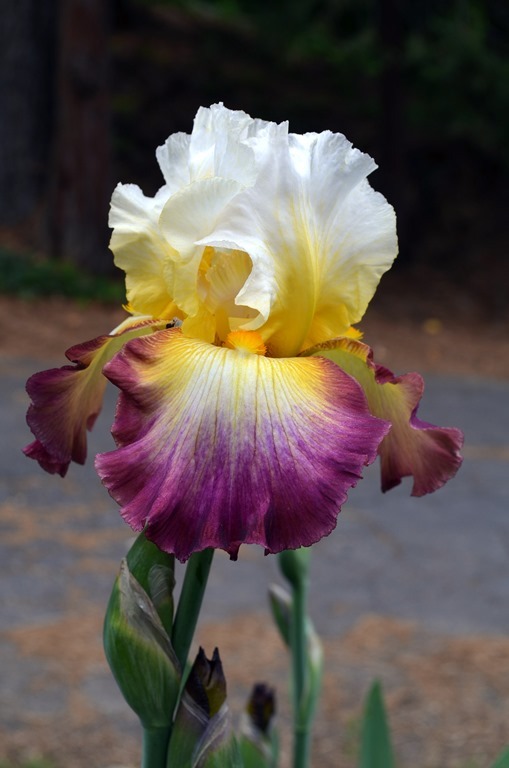 Prettiest iris I have ever seen. EXQUISITE! They are delightful Pamela. Thank you for linking up at Shabbilicious Friday. I too love the many wonderful variety of iris. Your pictures are great! I’m sure you are looking forward to Spring too.